Samuel Dixon Family Health Centers Inc. has announced that the grand prize for the 10th Annual Rubber Ducky Festival will be a $2,500 gift certificate for Southwest Airline travel. Winner does not need to be present to win and may use the certificate towards any combination of airfare travel on Southwest Airlines. The Rubber Ducky Festival will be held from 11 a.m. to 3 p.m. on Saturday, October 27, at Bridgeport Park on Newhall Ranch Road in Valencia. The fun-filled family festival features rubber ducky regatta races beginning at noon. Several heats will be held throughout the day and winning qualifiers from each race will compete for prizes during the Grand Regatta, the final race of the day. 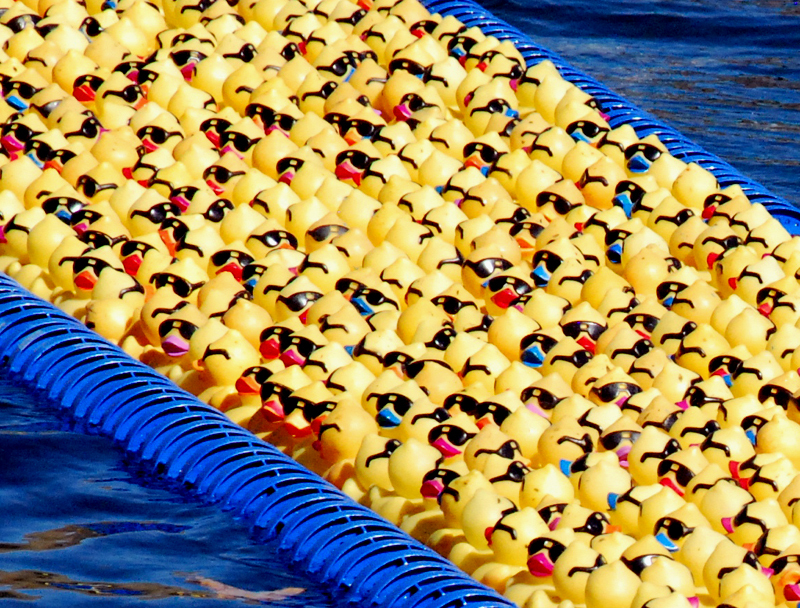 Last year approximately 4,000 rubber ducks entered the water competing for prizes, each duck adopted by community members. Rubber ducks are available for adoption at $5 per duck, making the event affordable for everyone. Other adoption opportunities include: Quack Family (5 ducks plus 1 free duck for $25); Quacker’s Dozen (10 ducks plus 2 free ducks for $50) and Duck Flock (20 ducks plus 4 free ducks for $100). Visit www.duckrace.com/scv for more information on duck adoptions. All proceeds from the event go toward patient care at SDFHC, which offers affordable, quality primary health care for residents of the Santa Clarita Valley. SDFHC makes a special effort to serve the uninsured and underinsured. Last year’s Rubber Ducky Regatta raised $30,000 that went directly toward patient care at the non-profit organization’s three health centers. “Our goal this year is to raise even more funds that will allow us to continue to provide health care services to anyone in need through our community health centers and outreach programs,” said Cheryl Laymon, executive director of SDFHC. Los Angeles County Supervisor Michael Antonovich serves as this year’s Honorary Chairman. City of Santa Clarita Mayor Pro Tem Bob Kellar and Janice Murray, host of the Non-Profit Spotlight show on KHTS AM-1220, co-host the event as Masters of Ceremonies. CBS/KCAL news anchor Sandra Mitchell returns as the celebrity guest. Matt Gunderman with Boston Scientific serves as this year’s Rubber Ducky Festival chairman. In addition to duck races, games, activities and vendor booths, the event features food and entertainment. SDFHC thanks sponsors of this year’s event: Boston Scientific, SCV Rotary, Providence Holy Cross Medical Center, Henry Mayo Newhall Memorial Hospital, Kaiser Permanente, Point of View Communications, SOS Entertainment, C.A. Rasmussen Inc, and Hands On Santa Clarita, with special thanks to Andel Engineering. Media partners for this year’s event include: The Signal; The Magazine of Santa Clarita and elite Magazine; Santa Clarita Living Magazine and Canyon Country Magazine; SCVTV; KHTS AM 1220; Smart Shopper; Inside SCV Magazine; Our Valleys Magazine and Edwards Outdoor Advertising. The annual Rubber Ducky Festival, also known as the Rubber Ducky Regatta, is SDFHC’s signature fundraising event providing operational funding throughout the year. SDFHC operates three health centers in the Santa Clarita Valley—Canyon Country Health Center, Val Verde Health Center and Newhall Health Center—as well as outreach sites at College of the Canyons and California Institute of the Arts. SDFHC offers a full range of health care services— physicals, immunizations and vaccines, screenings and diagnostic tests, well baby care, and family planning. Patients pay based on their income. This past year, SDFHC provided service for 11,000 patient visits. About Samuel Dixon Family Health Centers Inc.